It’s been a whirlwind week for the Cincinnati Reds. It’s also been one of those weeks for me. I’ll be leaving for Goodyear on Friday, so if you’re looking for all of the good coverage from the backfields (or, well, any) be sure to follow me just about everywhere on the interweb. With all of that said, it seems like a good time to bring back an All Questions Answered thread. I’ll be around to start answering questions starting roughly at noon, though you can submit them before then. Anything asked before 8pm will be answered – but I’m not sure I will get to anything beyond then. As always, there are some rules for the thread today. Just a reminder that while my specialty is in the Minor Leagues, I’m more than willing to dive into questions about Major Leaguers, too. Try to avoid overly long answer-type questions. I tend to give thorough and detailed answers as it is, so please donÃ¢â‚¬â„¢t have me type out a novel. Each user can ask TWO questions. Ask your questions before 8PM and I will be sure to answer it. If you ask after 8PM on Wednesday, then I canÃ¢â‚¬â„¢t guarantee that I will answer your question. Have a good trip to Arizona. Look forward to your reports. 1. Can you envision a reality of a rookie influenced bench with Ervin, Blandino and Dixon? 2. Who is the one minor league player you are itching to see in person play while you ate in AZ? **”are” not “ate”. You aren’t Hanibal the Canibal. Sorry. 1. Can I? Sure. Can I in April of 2018? No, unfortunately I can’t. I think there’s a chance one of those guys makes the bench in April. 2. Are you saying that I can’t eat lunch while watching the games next week? There are two very easy answers for me: Jose Garcia and Hunter Greene. I’m hoping Greene is scheduled to pitch in Goodyear and not on the road while I’m there, but I’m going to talk to the Reds people and see when he’s slated to throw, and will travel to see him pitch if needed. Thanks for the answers. Last year it was Luis Castillo and that worked out well. Interested to read what you find out on Garcia and Greene. Do they have concession stands at the back fields? A man can only eat so much chicken-on-a-stick or iguana-on-a-stick. I thought you might go to Big Mike’s (Steve M.’s recommendation last year) for a big breakfast to fuel your long days at the fields. No concession stands. Two water fountains, a small section of bleachers for each of the four fields (like, that can seat 15 people), and a mens and womens restroom. I’ll do everything I can to have a safe trip there and back. Do you believe Tyler Mahle should start the season in AAA, even if his Spring numbers are outstanding and he outperforms Stephenson, Lorenzen, Garrett? This is assuming no Finnegan or Disco starting the season with the team. If Peraza performs poorly, or gets injured to start the season, do you think that Senzel will get called up before the Super 2 date? They can’t try to survive with Pennington for 2.5 months can they? 1. Tough question – generally speaking, I’m not a guy who believes that spring training numbers should ever determine a job. My thought is this: If he entered the spring as the guy who should have been #x pitcher on your depth chart, he should remain there unless there’s a significant reason he should be moved in one direction or the other (see Garrett, who is throwing significantly harder today – as a reason why someone should possibly move up from where they began the spring). For me, I’d start him in Triple-A if for no other reason than I’d go with Bailey/Castillo/Romano/Stephenson as the 1-4, and whoever the #5 is won’t be needed until two weeks into the season – so there is no need to carry them on March 29th. Mahle, or Garrett, could come join the rotation when needed at that point. 2. Before the Super 2 date, absolutely. Before the April 8th date that would cost the Reds that extra season at the back of his contract? No way. What top Reds prospects, such as Hunter Greene perhaps, will we see move up to Pensacola sometime this year? Which Reds prospects that are getting a cup of coffee in spring training this year will be sent all the way down to AA rather than AAA? Also, hoping to eventually get the Reds back where they belong in the Spring… Florida! 1. There’s ZERO chance that Hunter Greene reaches Pensacola this year. None. He’s 18-years-old. I’d be very, very surprised if he threw a single pitch in Daytona this season. He’ll be in Dayton. I’d look for Vladimir Gutierrez to start the year. In the second half you could see Taylor Trammell, Jose Siri, maybe Tyler Stephenson (though I think they’ll go year-to-year with him in terms of promotions go because he’s a catcher), maybe Tony Santillan. Guys like Shed Long, Aristides Aquino, Jesus Reyes, Gavin LaValley, Nick Longhi – they’ll probably all be back to start the year in Double-A. 2. Aquino, Long, Reyes. Maybe some of the relievers. What do you think is Cody Reed’s potential to eventually make a real impact in the Reds rotation? Where do you think he will land after spring training – Cincy / AAA, bullpen / starting – and where do you see him in the long run, including the likelihood of a trade or release? The potential is there, but he’s also a guy who walked 5.2 batters per 9 innings pitched in Triple-A last season. That alone means that the odds of him making a real impact in the rotation small. Toss in that he’s probably a decent way down the depth chart, behind other legitimate arms, and it means even getting the opportunity is smaller than it may be elsewhere. I think he’ll end up in Louisville, starting. No clue on the liklehood of a trade. They aren’t going to just outright release him, though. When a player gets assigned to a minor league camp, what does that entail for the player? Backfields, but what about locker rooms and other team activities? Well, I wish I could be certain, but since the Reds don’t grant me access to the spring training facilities, I can’t tell you much about the lockerroom situation. I’ll assume there’s a different one for the minor league guys than the big league camp guys, because in total, you’re talking about 225-ish players between those two groups. As far as team activities go – once you’re in the minor league side of camp, you’re with a specific team – though not always the one you will begin the year with (trickle downs happen here, too). You go about your day with that team, doing the workouts/drills/games with them just like you would any other “team” you were on. 1. 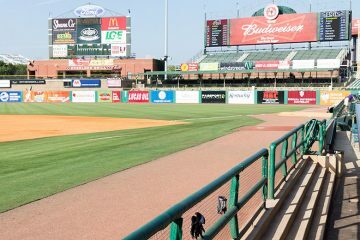 What is your prediction of top 100 prospects in the Reds Farm System in the winter of 2019? How many and Who? Safe travels to Spring training! That’s two years from now, so I’m going to be assuming plenty of graduations here. So, let’s go with Hunter Greene, Taylor Trammell, Tyler Stephenson, Vladimir Gutierrez, Tony Santillan and Jeter Downs. I was meaning one year from now. The Super 2 thing bothers me. If a player is good enough to be on the Reds be there. What if he is in the minors & is seriously injured then you never get to see him. This rarely happens. You’re talking about a span of two months where someone would theoretically injure themselves, while in Triple-A, and then never recover to the point that they would reach the Majors. 1. Doesn’t Jeter Downs have a legitimate chance of being a shortstop in the majors or will he have to switch positions later on? 2. In your honest opinion, do you think Amir is more suited for the rotation or the bullpen in the long run? 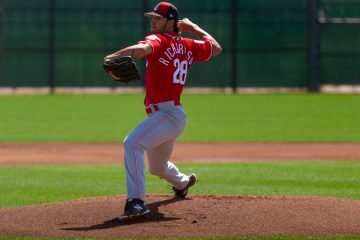 He’s looked really good coming out of the pen this spring training and the Reds could use another reliable lefty in there. 1. There’s a chance. Some believe that he’ll eventually need to slide to second or third – it just depends. As it is with most shortstops, it’s going to have to be a wait-and-see game. 2. As things stand right this second, bullpen. But, I think it would be foolish to not have him starting right now. There’s a chance for him to be a real good starter – and in a season for the Reds like 2018, I’m taking that time to see if he can start instead of forcing the bullpen from the beginning. If it’s July and you aren’t seeing enough as a starter, then you make the move to the bullpen. Which of the A/HIgh A pitchers is most likely to move up to Pensacola mid-season AND/OR possibly a Sept. callup? The odds aren’t good of anyone starting in A-ball reaching the Majors as a call up this year. None of those guys are on the 40-man, so they’d have to be so utterly dominant that they’d force it. I just can’t see that happening – the only time things like that happen are with elite arms and when it makes sense to toss that guy into the bullpen at the end of the year for a playoff thing. Among the arms in A-ball, I think only Tony Santillan has that kind of arm, and, well, as much as I wish the Reds will be in the playoffs in October of 2018, I don’t think it’s all that likely. Starting a guys clock early for no reason doesn’t make sense, so I wouldn’t count on anything like this playing out. Now, as to moving to Pensacola – Santillan’s got a chance. Scott Moss has a chance. I read top 10 lists of farm systems and the Reds are in almost if not all somewhere. Can you expand generally on the status of our pipeline in terms of acquiring and developing guys? Are we better at picking them or developing them relative to other organizations? Are we actually risky with injury histories or on par with the other teams? This is a general conjecture question. Thanks! I believe the Reds are better at drafting than most teams, but not as good at developing as some teams. The Reds are generally pretty good when it comes to turning their 1st/2nd rounders into big leaguers when compared to baseball. What they haven’t done, that’s essential, is find that superstar. Joey Votto was drafted in 2002. That was a real long time ago. Johnny Cueto could probably be classified as that, at least for a brief time, but he wasn’t drafted, and even he was signed back in 2003 (or maybe 2004). Where they’ve also seemed to really be missing, and maybe it’s just pure luck, but they haven’t found that lower round, non-big bonus guy that they’ve developed into a good player for quite a while. With injuries, at least on the minor league level, I don’t think the Reds are much different than other teams. At the Major League level, I think the last few years has been a real problem. Shed Long ceiling and floor? Ceiling: .280/.350/.475 with 10-15 steals. Floor: Doesn’t adjust to upper minors pitching and never makes the Majors. I think that floor is unlikely, but, that’s technically the floor even if it’s not an expected one. Thanks for doing this, Doug, and enjoy your trip. 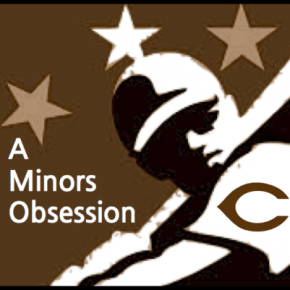 1 – Who do you think are the best “under-the-radar” prospects in the organization, best pitcher and best position player, who aren’t ranked or mentioned very often, if at all? And what is it about those two you like the most? 2 – It’s early, but what’s your guess on what the Reds will do with their first pick in the draft – will they/should they go college arm or position, or high school arm or position? And who might some of those targets be? 1. I’ll say either Miles Gordon or Andy Sugilio. They ranked 14th and 15th for me, but were outside of the Top 30 at both Baseball America and MLB Pipeline. I talked with people that had very good things to say about both of them, and both beat up on pitchers in the Pioneer League last season, too. Sugilio has real good tools, and he produced. There’s some work to do in order to get the most out of those tools, but they are there. Gordon has some tools, too, though maybe not as many, but he’s a better hitter right now, too. Thanks for doing these Doug, they’re always very informative. Is is time to stop thinking about Dilson Herrera as someone that could potentially help the Reds at some point? Seems like people are asking all the other questions I would ask. I really hope Amir is given every opportunity to be a starter. 1. I’m not. When he’s been healthy, he’s always hit. If he can get healthy, he’ll probably hit again. And if he does, he’s got to be in the conversation. 1.In the past teams like the pirates have immediately offered a top prospect, as soon as they are called up, a long term deal to either provide the team with cost certainty and/or buy out a year or two of free agency for the player. The player himself obviously gets money guaranteed upfront, albeit at a huge discount assuming the player reaches his potential. My question is do you think this would be a good move on a player like Nick Senzel? If you do what would you offer? 2. Given Brandon Finegan is fine to start the year and there are no additional injuries or additional additions from a trade or free agent, who would be your 5 SP to start the year for the Reds? 1. It’s a great move for the team. It’s generally a terrible move for the player. If I were a pitcher, I’d consider it very differently than if I were a pitcher (well, probably not because as the player you aren’t telling yourself “chances are I get hurt”, even if the information says that the odds are far greater that you could). But, as a position player, I’d always bet on myself and never accept that kind of deal unless it was for market value of what I thought I’d be, and teams just aren’t going to make those kinds of offers. If I’m the Reds, though, I’m going to Senzel with an offer similar to that of Evan Longoria, but adjusted for the time. So, something like $650k, $1M, $2M, $5M, $8M, $12M, $17M, $17M. 2. Castillo, Bailey, Finnegan, Romano – and given how Stephenson threw today, I’d be looking at Mahle or Garrett. 1. Is there any real chance Herget or Weiss make the club? 2. Who would you have starting the year in the Reds bullpen? 1. I think there is a real chance, assuming we consider something like a 20% chance, real. 2. Iglesias, Lorenzen, Peralta, Hughes, Hernandez (David), Shackelford would be my six. The 7th spot would be undecided currently. Perez (as a LOOGY), Reed, Herget, Crockett (as a LOOGY), Stephens, and Weiss would all be guys I’d keep in the conversation for that final spot for the next two weeks. 1) Any news/projection on Tejay Antone? 2) Any news/projection on Tony Santillan? 3) Any news/projection on Aristides Aquino? No. No. And No. The first two haven’t even begun to play spring games yet (games start tomorrow for minor leaguers). I may have some stuff on them next week when I’m out in Arizona. I never realized that they started so late. I guess I should have deduced that you’re choosing to go now in order to catch some minors action. Thanks for taking the time to answer me. I’ll look for my info as it becomes available. Enjoy the trip, and bring sunscreen! Generally the minor league season starts a week after the big league one does. Spring training games for them usually start mid-March. The position guys, for example, didn’t even report until March 4th this season. This is only going to be my third year doing the spring training thing, but I always try to go a bit later because my focus, of course, is on the minor league side of things and yeah – they start later. I’ll have plenty of coverage and updates from my time out there, but can’t promise anything specifically on those guys. The pitchers in particular, could be pitching on a day when they are on the road, so I may not even see them in games. That was fun guys. Thanks for stopping in and asking some questions.